We list 5 anaerobic digestion problems which are common to the biogas process, and are easily and rapidly corrected for and avoided, at AD facilities run by expert biogas plant operators. BUT, the same problems can be disastrous/ cause long digester-downtime in the hands of novice Anaerobic Digestion Plant operators. Anaerobic digestion foaming is one of the most common anaerobic digestion problems. It is an operational problem in biogas plants with negative impacts on the biogas plant’s economy and environment. A survey of 16 Danish full-scale biogas plants for foaming problems, revealed that most of them had experienced foaming in their processes for up to three times per year. Foaming incidents often lasted from one day to three weeks, causing 20-50% biogas production loss. One foaming case history has been reported at a biogas plant indicated that the combination of feedstock composition and mixing pattern of the reactor was the main cause of foaming. This second of our listed anaerobic digestion problems is more correctly referred to as “over-acidification”, because acidification is in itself an important stage in healthy anaerobic digestion. It is one of the most expensive problems. When the digester biology is “over-acidified”, the effect can take months until the digester biology recovers, performance is restored. Throughout that period the biogas output will be reduced, and the operator must anxiously wait for the expected revenues to flow again. To avoid over-acidification it is important to control the digester biology continually, and to react to early-signs of problems quickly and in the correct way. Nearly always an overload of the digester biology is the cause for an acidification. Operators should not assume it is simply the loading rate which is the cause. Frequently, the problem has nothing to do with the loading rate of the digester, and other factors are the root cause. Overfeeding of the digester or too widely fluctuating substrate quantities. Fluctuations of the temperature, which can inhibit the biological activity of the bacteria. A lack of micro- and/or macronutrients limiting the biological growth/ metabolic rate of the bacteria. An inadvertent addition of toxic substances, effectively inhibiting the biological activity of the bacteria. The overload is in such circumstances caused by the fact that the methane bacteria are unable to grow fast enough to degrade the substrate to biogas. The cause for the slow-down in growth of the methane bacteria needs to be identified to ensure the right corrective action or extended delay in the recovery of the plant’s methane output will ensue. Corn silage has been reported as causing this problem, but it occurs with other silage types as well. It is reportedly most common when the optimum harvesting time is missed due to poor weather conditions. This can lead to silage corn stocks that are over-matured. High starch levels can be present, which can add to the problem. The use of these silage types causes problems in biogas production plant. Floating layers form and flow and pump properties deteriorate. An increasing VFA (Volatile fatty acids) and at times also in the TIC (Alkalinity, total inorganic carbonate buffer) value, may occur when the organic loading rate (OLR) is increased above a long-term stable rate. The biogas process becomes unstable, due to accumulation of volatile fatty acids (VFA), and/ or a non-optimum elevated (alkaline) pH. When the anaerobic digestion (AD) of biowaste is impaired it is the accumulation of volatile fatty acids (VFA) which in itself is cited as the cause of a process slow-down resulting in further VFA accumulation in a worsening cycle, unless the OLR is reduced. Lower than anticipated methane yield is very often the first indication of other problems, so it is important to continuously monitor the percentage of methane and other gases such as hydrogen sulphide (H2S), as an early-warning of the need to make adjustments to the digester operation. Low methane yield is a symptom of other problems, and is only included here for completeness. When methane yield drops, the operator should investigate the first four of the above five problems to find the underlying cause of the low methane yield. 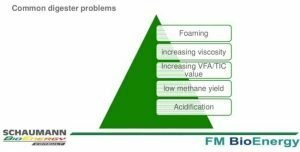 The two most common anaerobic digestion problems that occur during this bio-technological process in practice are, foam formation, and over-acidification. The first is the least serious and can often be rectified in the short term by the use of certain chemical additives, and in the longer term by modifying the feedstock and/ or improving mixing/ stabilising digester conditions and other measures to reduce stress on the digester biology. Although foaming may be a symptom of other more intractable problems, over-acidification can take the longer time of these two most common anaerobic digestion problems to correct and as a consequence of that, result in the biggest loss of biogas income. 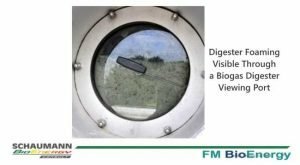 The moral of this article for new commercial biogas plant operators, to take-away with them, is the fact that going it alone, and not taking expert advice until you have gained your own practical experience – when biogas/ anaerobic digestion problems occur – can be a very expensive decision to take. Install good quality gas monitoring equipment and take expert anaerobic digestion process operational advice, in the initial months and years of biogas plant information. In that way there is no reason why biogas plants cannot be operated very successfully with very low-downtime rates. Disclaimer: The author is not a biogas process expert. This article has been compiled from online research, and should be regarded as no more than entertainment. As elsewhere on this website, no liability will be accepted for any loss arising from any action or inaction as a result of this article, or related videos. The reader/ viewer must make their own research and take action based upon that work alone. This is very informative and good work for references. To evaluate the feasibility of a planned biogas facility, one of the first questions is will there be enough methane, is the potential there in the local area? Here are my, basic considerations for designing an anaerobic digester. First, you know the temperature of the ambient air. You know the temperature you want to operate the reactor at. For example, it might be in the range known as mesophilic. Select your solid’s retention time based on your treatment objectives. You should already know your loadings. What’s gonna be put into the reactor day by day. The RHI only provides a small incentive to the supply of renewable heat through the combustion of biogas even if you can get it. Plus to be able to install CHP, so will still be driven by the availability of suitable local heat users and the associated costs of getting the supply to them. Heat recovered from a CHP unit associated with an AD facility that is used to provide heat for the AD process itself does not count towards the RHI. This disadvantages AD operators in the colder North. It’s a black art. Sounds sinister I know, but what I mean is that substrate just is so black in the tanks. It’s the art of substrate to digestate management. Keep-on rubbing me the right way, and you might get a genie. Jo – Top marks for the most wacky comment I think I’ve had yet! I’m not sure what your point is? So many problems. It must be a minefield. Thanks for sharing such a good piece of writing. It is good, that’s why i have read it fully. Please show my link. They can sell the waste CO2 back to the environment food producers. Maybe also sell them some of the fertiliser. They can truck this on the return journey, when they drop off the waste organic matter. That way the process becomes even more affordable :)﻿ Keep up posting these articles. Unique website! Thanks a lot for all the details. Sounds awful what can go wrong. But, take advice and these plants will be great.